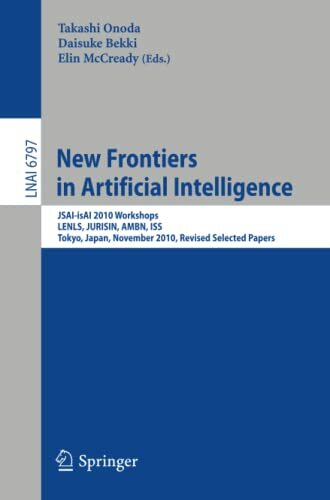 [PDF] New Frontiers in Artificial Intelligence: JSAI-isAI 2010 Workshops, LENLS, JURISIN, AMBN, ISS, Tokyo,Japan, November 18-19, 2010, Revised Selected ... / Lecture Notes in Artificial Intelligence) | Free eBooks Download - EBOOKEE! Description: This book constitutes the thoroughly refereed post-proceedings of four workshops held as satellite events of the JSAI International Symposia on Artificial Intelligence 2010, in Tokyo, Japan, in November 2010. The 28 revised full papers with four papers for the following four workshops presented were carefully reviewed and selected from 70 papers. The papers are organized in sections Logic and Engineering of Natural Language Semantics (LENLS), Juris-Informatics (JURISIN), Advanced Methodologies for Bayesian Networks (AMBN), and Innovating Service Systems (ISS). No comments for "[PDF] New Frontiers in Artificial Intelligence: JSAI-isAI 2010 Workshops, LENLS, JURISIN, AMBN, ISS, Tokyo,Japan, November 18-19, 2010, Revised Selected ... / Lecture Notes in Artificial Intelligence)".